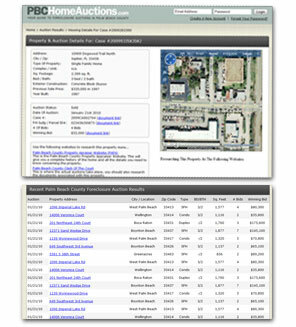 Palm Beach County auction foreclosure lists the easy way! Whether you are a first time home buyer, real estate investor, agent or broker this is the best time to buy, and buying a foreclosure at auction is one of the best ways to save and make huge money! Because of the huge number of foreclusures there are literally hundreds and hundreds of foreclosure properties going to auction each week and finding out what properties are up for auction is a time consuming process. PBCHomeAuctions.com does the work for you providing you with a clear foreclosure property listing for each auction so you can do your home work before getting in on the bidding action. You're left sorting through all the legal documents trying to find the addresses of which properties are coming up for auction. 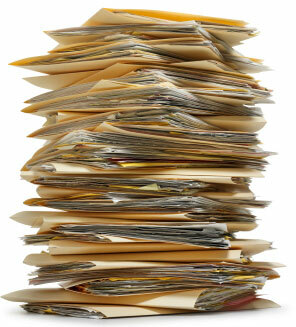 Once you find the address you need to manually look up each listing to find the details about it. Our staff does all the leg work for you. We comb through all the latest documents and provide you with a complete break down of every auction & which properties will be auctioned off. Saving you countless hours of your time.